Ithmar Capital Partners | Dubai – Ithmar Capital Partners focuses on offering niche alternative investment strategies built on a clear set of opportunities, a fitting structure, a supportive mandate, and a partnership based approach with its Clients. Headquartered out of the UAE, we are a unique investment team dedicated to making a difference. With a regional mandate and global aspirations, our focus is primarily on private equity growth and buyout situations. We are sector agnostic with extensive expertise in healthcare and education – sectors we believe matter the most. We also capitalize on special situations in public equities whilst utilizing a private equity approach to due diligence and upside value monetization, invest in Niche Real Estate opportunities. We are an active investor committed to adding true value to businesses we invest in and to forging long-term partnerships built on trust and mutual advantage. Our reputations as individuals and as a firm are paramount. We continually apply the highest standards of integrity, professionalism, and governance and we uphold our responsibility to deliver on commitments to our investors, our people, and our stakeholders. We work with like-minded business champions, forging long-term partnerships, building lasting collaborations and generating longstanding sustainable value. Key investments championed by our team. Al Noor Hospitals Group owned and operated hospitals and clinics across the United Arab Emirates. It was the leading private healthcare provider in Abu Dhabi and was listed on the London Stock Exchange in 2013 as a premium listing, FTSE 250 company by the Ithmar team. It has won EuroWeek’s “Best Deal in Middle East and Africa” and EMEA Finance “Best IPO in the Middle East”. The company merged with Mediclinic International in 2016. Abu Dhabi University is the largest private university in the UAE. It has four Colleges offering over 40 undergraduate and postgraduate programs through campuses in Abu Dhabi, Al Ain, Dubai and Al Dhafra Region. It has multiple affiliations with globally renowned institutions and is committed to being the institution of choice for students across the region. IMC is a multi-disciplinary hospital that features specialty centers providing a wide range of comprehensive treatments across the areas of Orthopedics, Cardiology, Oncology, Women's Health and Children's Health serving Saudi Arabia’s western region. IMC is JCI accredited and the hospital is equipped with state-of-the-art facilities that enable it to rank among the best healthcare providers in the region. As one of the largest education providers in the United Arab Emirates, Taaleem focuses on the development and management of early childhood, primary and secondary education. With quality at the forefront, Taaleem offers top international curricula including British, American, the International Baccalaureate and a multi-lingual, custom early childhood programme across the UAE. Belhoul Specialty hospital is a multi-specialty healthcare provider that provides advanced tertiary care combined with a holistic approach to Lifestyle management with an emphasis on Prevention and Cure. This specialty hospital offers the entire spectrum of multi-specialties with an extensive range of medical specialties, advanced diagnostic technology and outstanding services which has positioned it as a leading comprehensive healthcare provider in the region. Belhoul European Hospital was established as the first day care hospital in the UAE. It currently provides comprehensive medical facilities through its outpatient clinics. The medical specialties are supported by diagnostic facilities including radiology and laboratory. Other specialized support services include speech therapy, laser therapy, and physiotherapy which support multi-specialty clinics at the hospital. Sukoon International Holding Company provides acute extended care, critical care and home care medical services to patients who are no longer suited for care within a traditional hospital setting. Sukoon’s focused business model allows for higher quality of care at cost effective prices. The company’s flagship facility is located in Jeddah. DIS is a school of national identity set in an international frame. It breeds students who adhere to Islamic and Arabic values and traditions as well as provides students with an education that prepares them to cope up with the challenges of a rapid changing future. The school’s program accommodates grades k1-12 and is accredited by AdvancED, one of the world’s largest education networks. Dubai based leading pharmaceutical distribution company representing numerous global leading companies. GWT is a specialized company in the business of health care products and its related services, providing design, sales, installation, start-up, application training, and after-sales service, as well as turnkey projects. They represent some of the world’s most internationally renowned healthcare companies and support them regionally with their expertise and their factory trained physicians and engineers acting as product, service, and application specialists. With DIFC on your right and Emirates Towers on your left, drive straight over the roundabout and go right at the trafﬁc lights. Head down Al Sa’ada towards Dubai Mall. 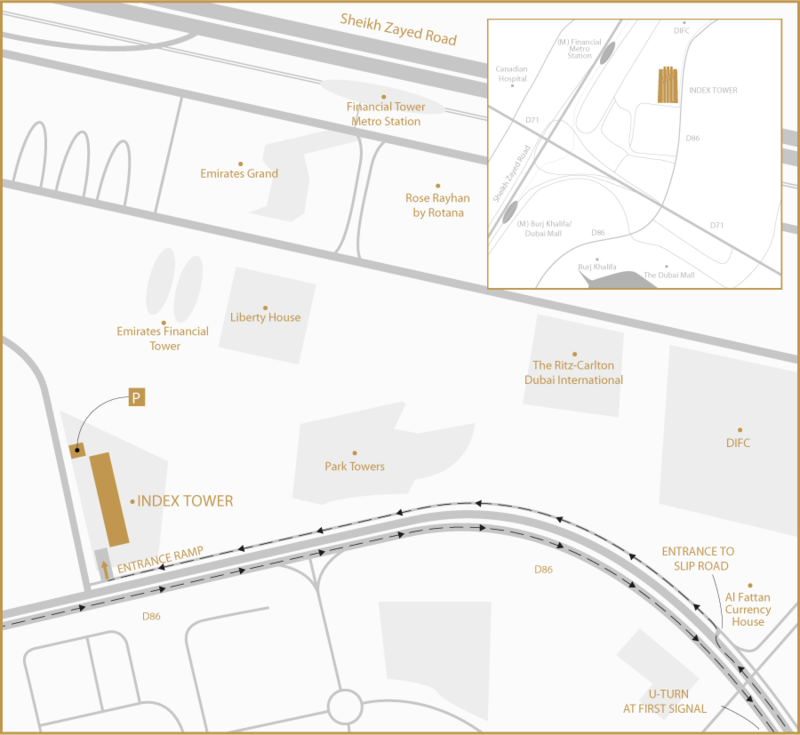 Continue to Al Fattan Currency House and take the slip road on the right. Continue along this slip road until you reach Index Tower. Follow the signs to the parking area. Head down Al Sa’ada Street (D86) towards Emirates Towers. When you arrive at the Emirates Towers trafﬁc lights, do a U-turn and head back down Al Sa’ada towards Dubai Mall. Continue to Al Fattan Currency House and take the slip road on the right. Continue along this slip road until you reach Index Tower. Follow the signs to the parking area.